But the actual result of the proposed amendment would be to finish off (with little hope of resuscitation) our existing Constitution of enumerated powers; and create a new system where Congress' unconstitutional legislation & spending is legitimized - as long as it is no more than 20% of the GDP. And since Congress, the executive branch and the judicial branch already ignore the limitations the existing Constitution places on their powers (they have no lawful authority outside of their enumerated powers); it would be no time at all before they ignore the 20% limit on spending. This "emergency" or that "emergency" would arise; and soon the 20% limit would be ignored as well. 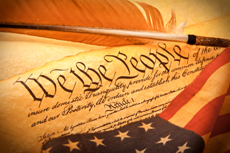 With The Constitution, WE THE PEOPLE ordained and established a Federation of States which united for the LIMITED PURPOSES enumerated in the Constitution: national defense, international commerce & relations; and domestically, the establishment of an uniform commercial system: Weights & measures, patents & copyrights, a monetary system based on gold & silver, bankruptcy laws, and mail delivery. That's about it! Read Art. I, Sec. 8, clauses 1-16, U.S. Constitution, and you will see for yourself how few are the powers delegated to Congress. Do you see? The objects on which Congress is authorized by the Constitution to make laws and spend money are few and enumerated. The Constitution does not permit Congress to appropriate funds for massive "entitlement" programs such as social security, Medicare and Medicaid. It is this lawless & unconstitutional spending which gave us a national debt of over $14 Trillion - a debt which increases at the rate of over $4 Billion a day! It is also this lawless & unconstitutional spending which has resulted in the federal government's increasing interference in the most intimate aspects of our lives. With obamacare, it now claims the power to decide whether we receive, or are denied, medical care: Who lives and who dies. Giving The Beast a constitutional claim to "only" 20% of the GNP will not reign it in. We need to man up and face the real problem: Congress legislates and spends money on objects for which it has no constitutional authority. The People, our elected officials, and appointed judges & officials are ignorant of The Constitution. Yet their hubris is so great [thanks to "self-esteem"- something which is taught in the government schools], they run around proposing amendments to a document they don't understand (and have most likely never read). Our Framers were far better educated than we are today. And unlike us, they knew how to think. We, today, can not improve on The Constitution they, led by intellectual luminaries such as James Madison, took months, working full time, to draft. In fact, our fiscal problems, and the increasing and systematic curtailments of our Freedoms, stem directly from our ignoring The Constitution they gave us. As a People, we have developed a cowardly mindset where we refuse to address the causes of our problems. We just want to treat the symptoms, blame-shift, and avoid the consequences. If we are overweight, we don't want to address our eating & exercise habits. Oh no! We want a "fix" - a pill; we blame our thyroid, our genes, or the medicine we are taking; and we want other people to pay the medical expenses resulting from our own destructive habits. We apply this same destructive mindset to the Constitution. Instead of manning up and facing the cause of our problems - which is that we want to live at other peoples' expense, and so elect politicians who promise us Plunder - we want a "fix" which permits us to blame-shift: It's The Constitution's fault! So we go around proposing Amendments, the ramifications of which we do not understand.